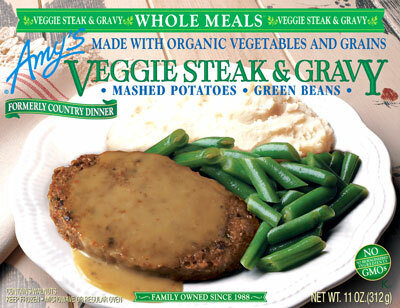 This week, it's another Amy's meal: Veggie Steak and Gravy Whole Meal. First up, let's talk terminology. The box calls this a veggie steak. I had very little faith that anything made of not-meat could even remotely resemble a real-meat steak. I ate it and was not surprised that it couldn't compare. Then, after reading the product description on the Amy's website, I realized that they're instead trying to imitate Salisbury steak, which is an entirely different thing. For non-meat-eaters who may not be aware: Salisbury steak is basically ground beef that is formed into a patty that is vaguely steak-shaped and served with a brown sauce (that's about as specific as Wikipedia gets). So, with that in mind, I re-assessed my experience. An important thing to remember when reviewing frozen entrees is that they're really not going to be as good as something that is freshly cooked. I shifted my expectations downwards and pulled the tray out of the box. Just about as pretty as I was expecting. I briefly considered taking a picture, but I figured most of you know what frozen meals look like. Just imagine mashed potatoes, green beans, and a brown blob with brown sauce. There you go. So I popped it into the microwave and cooked it up. Remembering the last time I ate Amy's mashed potatoes I was actually kind of looking forward to at least that part. And I didn't think it was possible to mess up frozen green beans. Luckily, I was not let down on either count. Again, best frozen mashed potatoes I've encountered. I did add just a touch of salt to these, but not as much as the low-sodium meal from last time. But you're not here to read about mashed potatoes and green beans. Let's get to the main event here. While I was cooking this meal, my kitchen filled with a strong (and exclusively) mushroom-y smell. This turned out to be the gravy. It was definitely a very strongly-flavored mushroom gravy, but when combined with the veggie steak, it was pretty reasonable. The biggest problem with the gravy (and this is probably due to the microwave-cooking element of the experience) was the creepy gummy texture. It was worse around the edges of the tray than in the middle, where it was actually pretty smooth, but the parts that were gummy really stuck to my teeth and the roof of my mouth, which was a little unpleasant. And now the veggie steak. After the first bite (which unfortunately had a good amount of gummy gravy) I was not impressed. The texture of the veggie steak was… odd. Without reading the ingredients, I was able to pick out oats and walnuts. The oats were kind of tough and chewy, the walnuts had that soft-crunch that I'm having trouble putting into words. For some reason, something in this meal contained cheddar cheese. I have to assume it was the veggie steak, although I couldn't taste it or see it. I do not know why a veggie steak would benefit from cheddar cheese. Any ideas? In any case, while I was trying to figure out whether I liked it, I managed to eat the whole thing. Not a tremendous feat, as the veggie steak was only about 4 inches by 3 inches, but better than tossing it after the first bite. 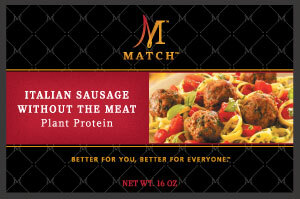 A while back, a reader of mine suggested I try Match Meat. I managed to find it at a store near me, but they only carried one variety - Italian Sausage. The website had a few different recipe ideas for using this product, but I went with my own recipe. I decided to just thaw it out, and use it in its crumbled form in a baked pasta. I did some recipe searching, and found one that sounded pretty good, but then I modified the heck out of it, so instead of linking to it, I'll just write up my version after the review. I'm not going to tease you with all my preparation stories. I'm just going to dive right in to the review. This stuff was good. The texture was nice and chewy, it had a strong fennel flavor with a bit of spiciness which I expect from Italian sausage. Alone it was a little weird, but it's not really eaten alone. With the tomato sauce and the cheese, it was awesome. And that's about all I have to say about that. Flavor - a little odd alone, but with the meal, lots of fennel flavor and a little spiciness. Preheat the oven to 350℉. Put a pot of water on for the pasta and start to heat that up while you do the next parts. Cook the onion and bell pepper in the olive oil in a large skillet over medium heat until soft, about 5-10 minutes. Add the garlic and red pepper flakes (if using) and cook until fragrant, about 30 seconds. Add in the crumbled Match Meat and cook until warm and slightly firmer, about 2-3 minutes. Stir in the two jars of sauce, cover, and simmer 15 minutes. Hopefully, your water is boiling at this point, so go ahead and throw in your pasta. Whatever the directions on the box say for cooking time, subtract about 2 minutes. You don't want the pasta to come out fully cooked, because you're going to cook it some more in the oven, and it'll come out mushy if you boil the pasta all the way. While the pasta is cooking and the sauce is simmering, stir together your three cheeses. Once the pasta is done, drain it and dump it into a really big bowl. Then add the sauce to the pasta and stir to coat all the pasta. Next up, stir in about two-thirds of the cheese mixture, and the sour cream. Dump this glorious combination into a 9x13" pan (hopefully it'll all fit!) and sprinkle the remaining cheese on top. Cover with foil (either non-stick foil, or regular foil that you've sprayed with cooking spray so the cheese doesn't stick to it) and bake for about 25 minutes. Then, remove the foil (fingers crossed for no stuck cheese) and bake until the cheese browns slightly, about 10 more minutes. You can also broil it to make this part go faster, but my broiler is scary, so I don't use it. Take it out of the oven and let it sit a few minutes if you can, then dig in! This week, I'm going to be talking about another Tofurky sausage: Tofurky Beer Brats. I readily admit that I'm not the biggest brat fan, especially since it's apparently completely inappropriate to top them with ketchup. The standard accompaniments are mustard and sauerkraut, which I don't like. But whatever - let's check them out anyway. I cooked them up on the grill until they were nice and hot, and served them up in buns. Ignoring all standards of decency, I slathered ketchup all over mine. Then, I went in for my first bite. I know I've talked about this before, but with real-meat sausages that are stuffed in a natural casing (yes - animal intestines - I'm under no illusions here), you get this nice snap when you bite into it, followed by a delightful juiciness. Without this casing, the sausage experience is kind of a big letdown. It's just mushy, with no burst of juice in the middle. I know I'm not alone in this being a disappointment. I have yet to find a sausage that can replicate that natural casing experience without using intestines. I keep trying though. Aside from the texture, there isn't too much to say about the flavor. It had a little bit of spiciness to it, but not much else. I'm used to a bunch of different spice flavors in a standard brat, but this just tasted like fake meat with a little heat. It wasn't a bad flavor, but it wasn't a desirable flavor, either. 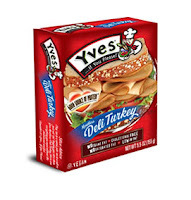 I went back and reread my other reviews of the Tofurky sausages, and they all pretty much say the same thing: bland, no strong flavors, not bad but not good. Come on, Tofurky - your sausages shouldn't be completely interchangeable - add flavors! On the up side, the promises they make on the website are completely accurate: "These Big Dogs actually SIZZLE on the grill and really fill out a bun." Yes, and yes. Of course, they go on to say that they are satisfying and delicious, which is a bit of a stretch, but hey - it's a start. Last up in the Mega Sandwich series is Yves Meatless Deli Turkey Slices. This stuff was a problem before I even got it out of the package. It broke when I was trying to extract a slice. This stuff is so dry that, when you fold it in half, it actually breaks. I'm not trying to say that it snaps or anything - it's not that bad - but it really should be more flexible. As before, I started with a single slice on the sandwich paired with some Swiss cheese. I couldn't taste anything, so I doubled up. With two slices, I could tell that it had kind of a weird funky taste, so I tasted it alone to see if I could identify it. Unfortunately, the only additional information I have for you at this point is that alone, the funky taste is much stronger. Not good. I must have been feeling very generous, or curious, because I tasted it plain with some Swiss cheese, just to see what it would do. With the cheese, the funky taste was reduced by about 75%, but it was still there. I just don't know what else to say about this. Not a great lunchmeat. Yves is totally striking out with me. First the terrible crumbly pepperoni and now this. Texture - when folded, it broke. Do I need to say more? Flavor - Some unidentifiable funky taste that was much improved with the application of some Swiss cheese, but not improved enough to make me want to eat it again.